As a real estate luxury marketing professionals, it is important to be aware of how ecology can be harmonious with luxury. Eco-Luxury is the new buzz word. It expresses those qualities and high standards that can be achieved without creating an imbalance in the ecology of the planet. It means sustainability defined as exploiting natural resources without destroying the ecological balance of an area. Eco-Luxury is a trend that has taken root among global luxury consumers. For some, it has become a status symbol. The impact is seen in luxury hybrid cars (Lexus, and Mercedes (2009)), runway fashion designers (Stella McCartney), and the travel industry (Luxury Camps and Lodges of the World). In the luxury building industry innovative home builders are using straw bale construction, rammed earth and rastra block construction. Rastra is made from concrete and recycled Styrofoam. 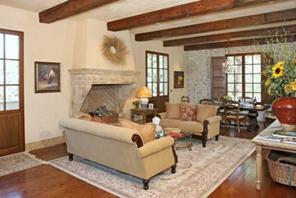 Builders are also recycling and reclaiming beams, fireplaces, stonework, etc. from torn down buildings and homes. The estate we feature here is located on a private knoll in Glenn Ellen, California. It is marketed exclusively by Maurice Tegelaar of Pacific Union, in Sonoma. It is an outstanding example of a eco-luxury and is built using Rastra Block.